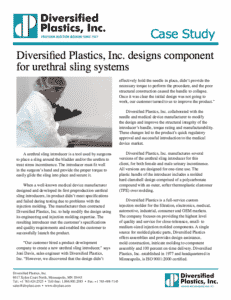 Case Studies, Plastic Molded Parts Design, Manufacturing Diversified Plastics, Inc. Using 3-D printing technology to create molds for producing prototype parts, Diversified Plastics helped a medical device manufacturer save thousands of dollars and weeks of time to produce prototypes. 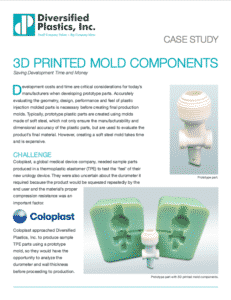 3D-Printed Mold Components Case Study. As a custom injection molder, Diversified Plastics is frequently approached by someone who has an idea for a better product. 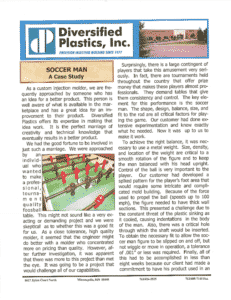 This client was well aware of what was available in the table soccer marketplace, and he wanted more. Diversified Plastics helped to modify design and manufacture several versions of a urethral sling introducer, which led to quick regulatory approval and successful introduction to the medical device market. Urethral Sling Introducer Case Study.